Traders in equities and other instruments know the significance of trader volume as a key measure of crowd psychology. The On Balance Volume indicator was popularized in US stock markets more than 50 years ago. But in the forex market, this indicator has only reflected tick volume. Until now. FXCM’s On Balance Real Volume indicator plots OBV for a given instrument, by looking at actual buy and sell trade volume data from FXCM’s thousands of live clients. When both price and OBV register fresh highs or lows in tandem, we can confirm the strength of the current trend. If price registers a new high, but Real OBV does not, we often note a significant bearish divergence. Which may mean that a trend doesn’t have the support of high volume trades. The On Balance Real Volume indicator is valued for its simplicity in showing trader conviction by putting a large amount of volume behind price movements. The On Balance Real Volume indicator works on multiple timeframes: m1, m5, m15, m30, H1, H2, H3, H4, H6, H8, D1, and W1. 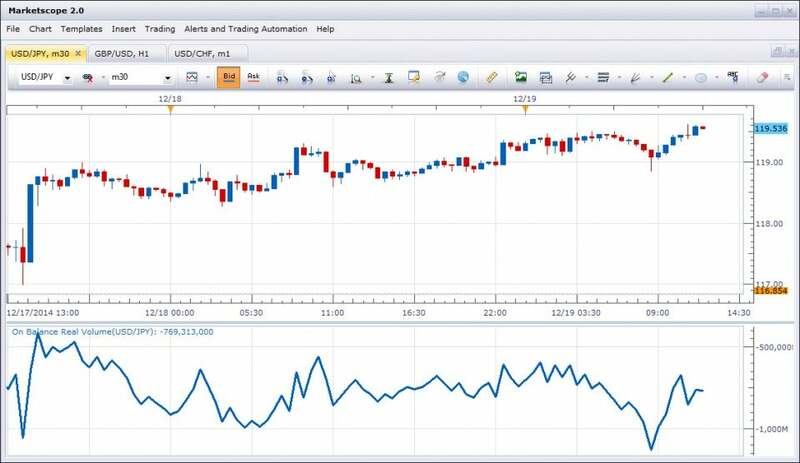 You can use these indicators with 14 currency pairs: EUR/USD, USD/JPY, GBP/USD, EUR/JPY, AUD/USD, GBP/JPY, USD/CAD, AUD/JPY, USD/CHF, EUR/CHF, NZD/USD, EUR/AUD, EUR/GBP and EUR/CAD.